Having a cabin or cottage means having a place to get away from the norm and really relax. This is often also reflected in the interior design. While your main home may be a bit more traditional in it’s decor, a cabin is where you can get really creative with the space. The materials, colors, and uniqueness of your decor can be played up to the point of making your vacation home interior extra fun and whimsical. 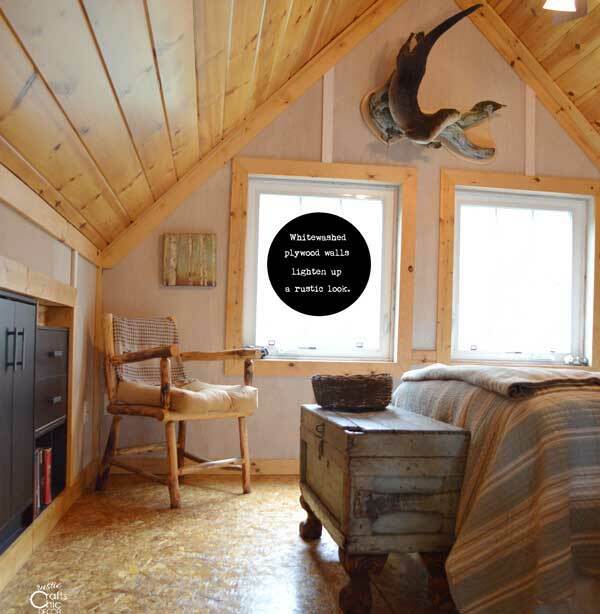 There are lots of ways to incorporate a more relaxed and whimsical design into your cabin or cottage. Whether you use unique antiques, vibrant colors, or out of the ordinary finishes, what you put into the design can determine the overall feel of the space. Here are some cabin interior decorating ideas to inspire the design of your own space. All of these decorating ideas are easy to incorporate. It’s just a matter of sometimes thinking outside the box. 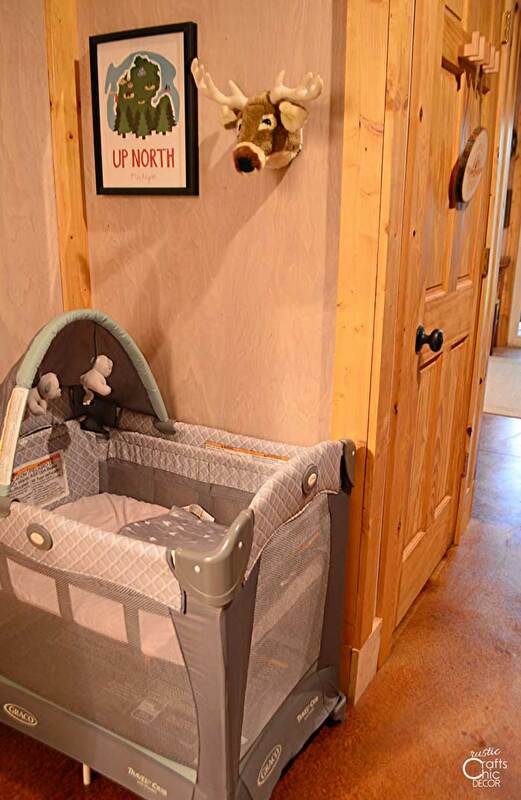 Items that you may never consider putting into your home decor could be perfect for decorating your cabin. When you incorporate vintage or distressed pieces into your decor, you get an instant relaxed feeling. Using items that help to tell the story of your cabin give the pieces more meaning. For instance, if you have a cabin on a fishing lake, you might want to incorporate old fishing reels and poles, canoe paddles, or minnow buckets. 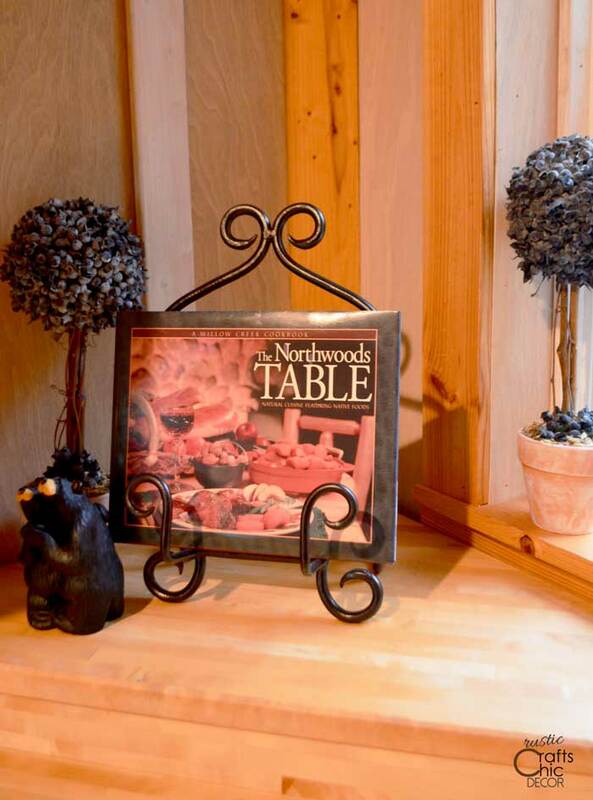 Vintage snow shoes, skis or ice skates are fun cabin winter decor ideas. 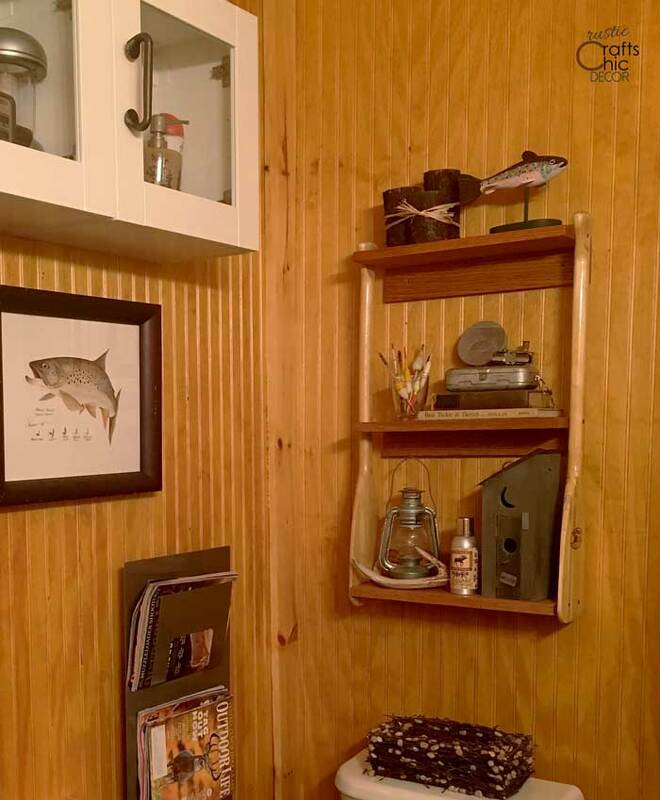 One of our cabin bathrooms is full of vintage fishing decor combined with some whimsical pieces like the wooden outhouse and colorful fish. We also used a couple of short paddles to complete the sides of the DIY shelving unit. The tissue box cover and log candle holder set were also handmade items that brought in a little nature. Another great way to get some vintage accessories into your space is to use antique picture frames and books. You can find all kinds of old frames, with or without the prints, at resale shops and thrift stores. Buy a frame that you like and then insert your favorite rustic print. Old books are also easy to find. A stack of books makes a great base for adding height to other decor. If you can find books are your particular theme, such as fishing, all the better! You don’t necessarily have to have a specific theme for picking out your vintage pieces. Some more generic pieces include things like this old Hudson Bay blanket and antique lantern. Both of these items give off a rustic cabin feel. Vintage furniture is great to incorporate into a cabin interior. You don’t even need to refinish it because the more distressed, the more character. 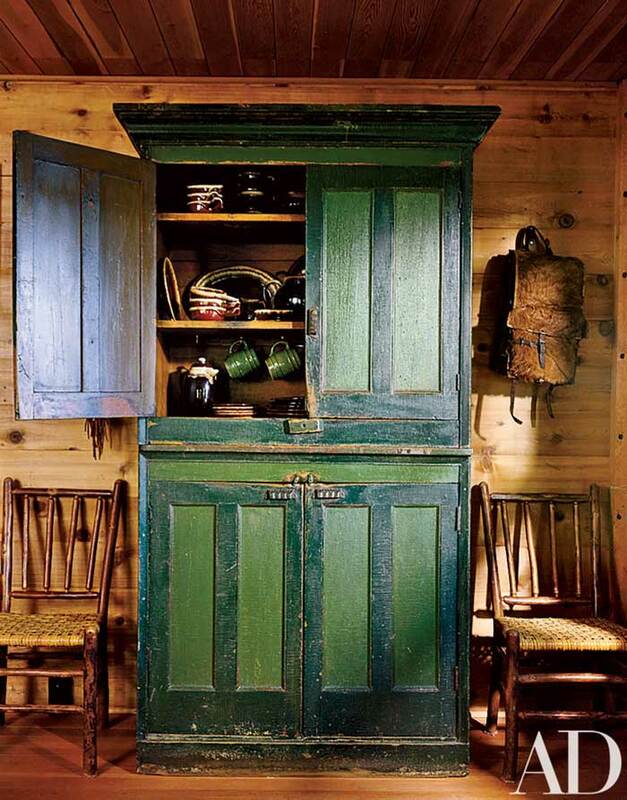 This vintage armoire gives important storage space to a small cabin kitchen. Old dressers, bed frames, and tables are all fun furnishings to use in a cabin. Any decor that is unexpected and stands out from the rest would be considered whimsical. To create a fun cabin atmosphere, it’s good to incorporate a little of the unusual. You don’t want to have too much though because then it won’t stand out and have impact. I like quirky decor pieces that make an area a little more fun. Cabin decor definitely doesn’t have to be all serious! This stuffed deer head just makes me smile. It’s a little lighter side to a hunting cabin theme. The sleeping area that is dedicated to the kids still has a rustic theme that is just more playful. Whimsical figurines are also fun and playful to decorate with. Basically, things that make you smile should be incorporated in your decor. I love finding unique decor items from art galleries as well. Add a little whimsy with unusual materials like these birch dining table legs. It’s the unexpected that makes such a fun design. All of the different colors and patterns also create a ton of playful interest. Have fun with color and patterns! Bright colors can look more playful and patterns add a lot of interest and whimsy. 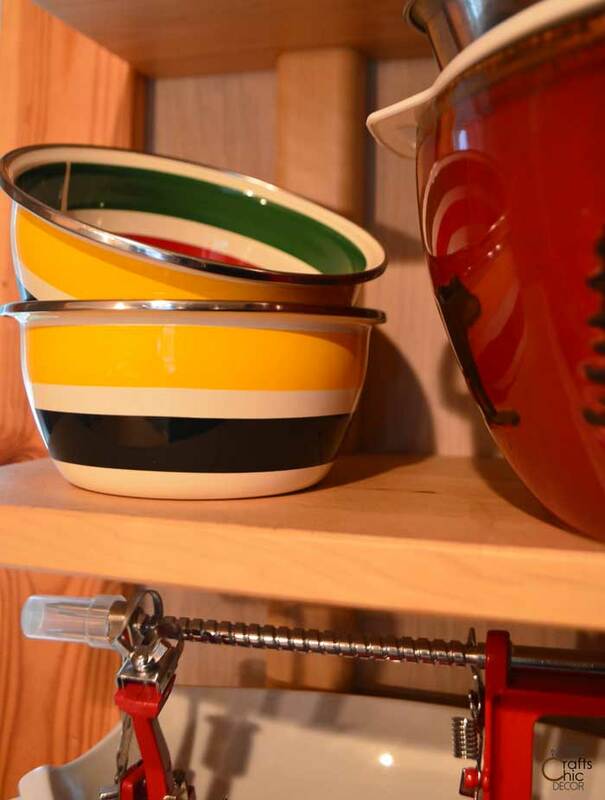 I love the colorful stripe in Hudson Bay blankets so when I found these striped bowls, I knew I had to have them in my kitchen. 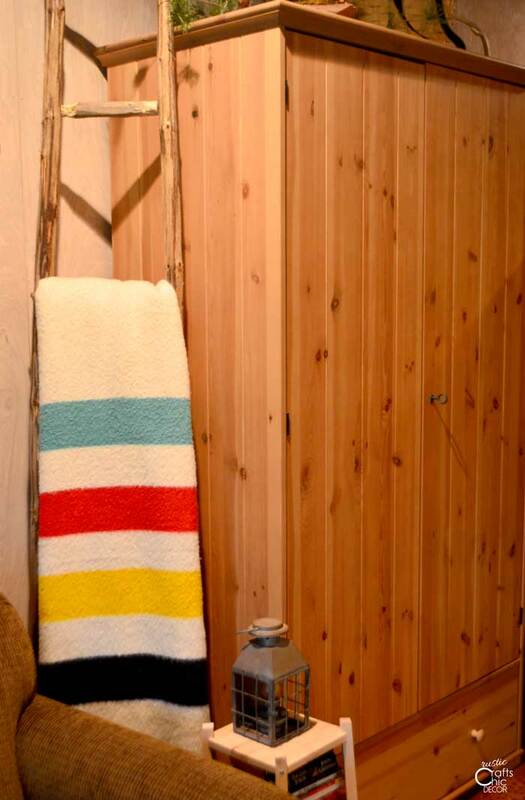 The wool blanket inspired stripes are both rustic and playful. Bright colors tend to look less serious and therefore more relaxed and fun. Switching out traditional cabinet knobs for more artsy ones also makes the design more playful. And, if you can’t decide which knob style to use, just use the all. 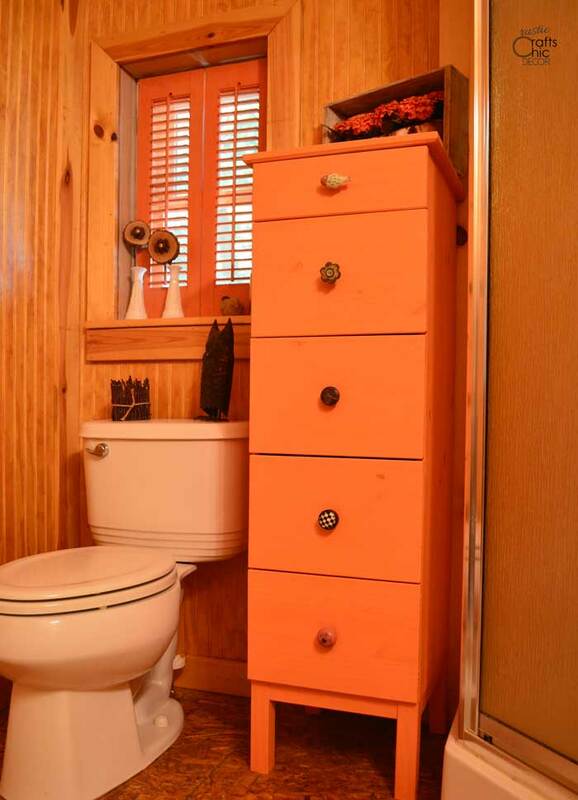 The mix of knobs also says carefree. 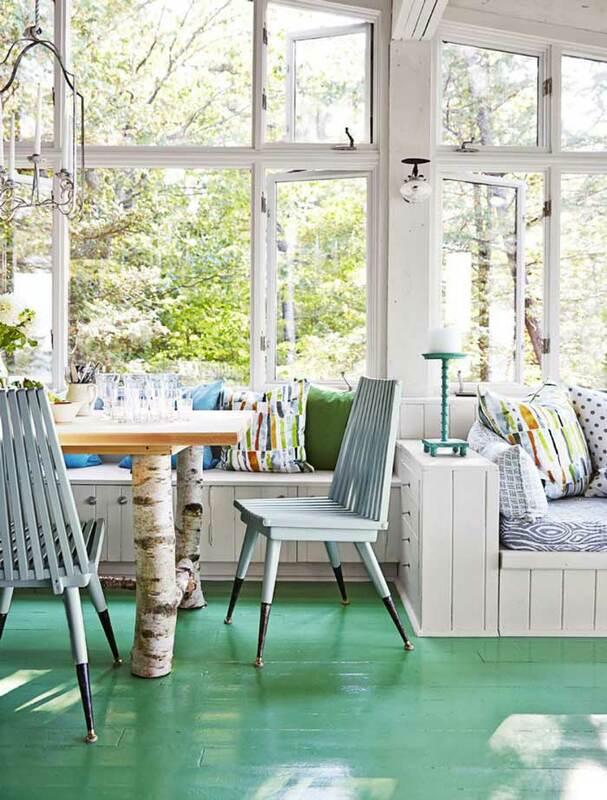 Even just little splashes of color can brighten up a cabin interior. A few small colorful accessories or a bouquet of cheery flowers makes a neutral space more happy. Varying the finish textures and furnishings also creates a playful pattern. I love the mismatched chairs in this dining area. 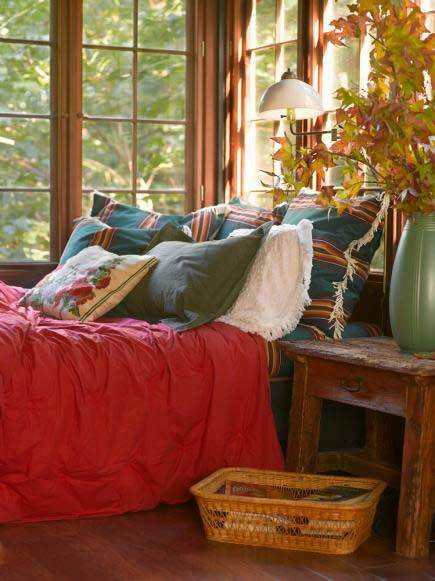 Warm and rustic colors can look especially inviting and cozy. A variety of oversized patterned throw pillows also add to the relaxing atmosphere. This modern cabin interior is full of visual interest. The plywood walls create an interesting pattern with the grain of the wood. 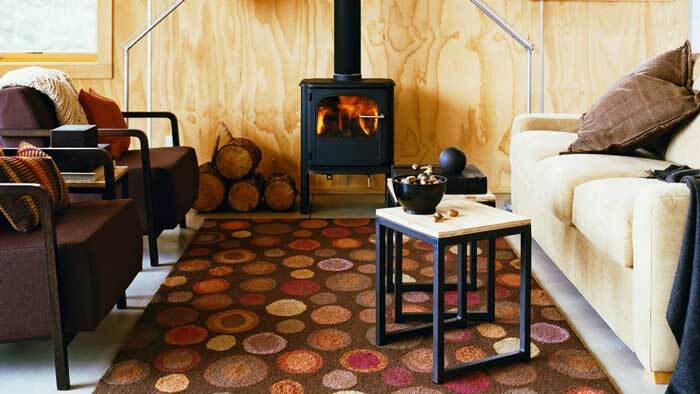 And, the playful rug is colorful and subtle at the same time. We did similar plywood walls in our cabin but to lighten them up a little, we applied a white wash stain to them. Because the stain is shear, we can still see some of the wood grain but are able to keep things lighter and brighter in our small space. 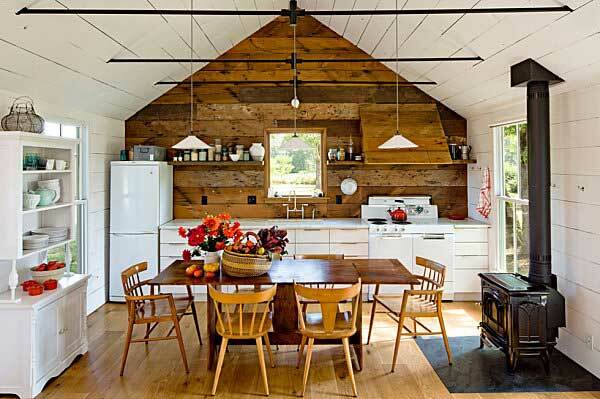 The lighter plywood walls also offer a bigger contrast to the knotty pine ceiling and trim. Not only are the walls a little out of the ordinary, but the floor is as well. We simply added floor polyurethane to the OSB to finish them off. The color ended up matching the ceiling perfectly.